2007 - 2018 JEEP WRANGLER UNLIMITED JK COIL SPRINGS SET OF FOUR (4) OEM MOPAR. Condition is Used. Shipped with Standard Shipping. The Raptor Series Antirock front sway bar kit provides balanced performance of front and rear suspension for rugged off road conditions. Especially when combined with a rear Antirock sway bar kit. The front and rear sway bar kit installed will provide proper weight distribution, and proper weight balance to all 4 tires. The front sway bar kit is a direct replacement for the stock front sway bar, and is constructed of SAE 4130 heat treated steel for maximum strength, which is the same quality found in professional off-road competition sway bars. Included is everything needed for a ready installation. This includes the sway bar, semi-gloss black powder coated bolt-on steel frame brackets, delron bushings, semi-gloss black powder coated arms, adjustable length helm jointed sway bar links, lon. Fox Racing Front / Rear 2.0 Factory Performance Series IFP ShockFor 07-18 Jeep® Wrangler & Wrangler Unlimited JK. 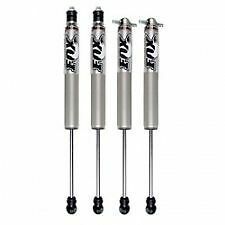 Fox Racing Front / Rear 2.0 Factory Performance Series IFP Shock For 07-18 Jeep® Wrangler & Wrangler Unlimited JK. The Raptor Series Antirock rear sway bar kit provides balanced performance of front and rear suspension for rugged off road conditions. Especially when combined with a front Antirock sway bar kit. The front and rear sway bar kit installed will provide proper weight distribution, and proper weight balance to all 4 tires. The rear sway bar kit is a direct replacement for the stock rear sway bar, and is constructed of SAE 4130 heat treated steel for maximum strength, which is the same quality found in professional off-road competition sway bars. Included is everything needed for a ready installation. This includes the sway bar, semi-gloss black powder coated bolt-on steel frame brackets, delron bushings, semi-gloss black powder coated arms, adjustable length helm jointed sway bar links, long. 2007 - 2018 JEEP WRANGLER JK. TAKEN OFF OF A GENUINE JEEP WRANGLER JK'S. COILS SPRINGS SET OF FOUR (4). DON'T YOU SEE WHAT YOU NEED?. SOUTHERN CALIFORNIA JEEP DISMANTLING YARD. OVER 2 ACRES OF Chrysler JEEP PARTS. At the heart of any true Jeep suspension system are properly designed coil springs. Not everyone uses their Jeep for the same purposes, therefore you need a coil spring that adapts to different terrains both on and offroad. Raptor Series coils provide the best performance in any situation. Whether loaded down with gear for a weeklong expedition, running light for some rock-crawling fun or loaded with a few friends for a trip to the beach, Raptor Series coils will provide the ride you want and the performance you need. Super Springs SumoSpring part# SSF-401-47 bumpstop is a suspension product designed to stabilize sway and enhance the load carrying ability of your vehicle. Sumo Springs work great for RV's, trucks or vans. They give a smoother ride that dampens road noise and shock. RE1371 Rubicon Express Coil Spring For Jeep Wrangler JK 3.6-3.8L 2007-2018. 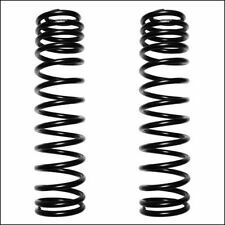 Coil Springs; Pair; Front; 2 in. Lift;. Model: Wrangler. Make: Fits: Jeep. The final lift height may vary depending on the weight of your vehicle and the accessories installed. Orders are typically processed within 24 hours. Our goal is to provide top quality parts and accessories at rock bottom prices. Manufacturer Part Number: 55204. 2018 Jeep Wrangler JL. Position: Rear. Country of Origin: USA. Easy to install. Rubicon coils are designed to provide the best in ride quality without sacrificing durability and load capacity. All coils are powder coated silver. Our coils are made with the most advanced processes in the industry. (Fits 2018 Jeep Wrangler JL. New Mopar Right Lower Isolator Spring. This part is OEM and a Quality Fit! Warranties are only valid in the U.S.A. excluded are Alaska, Hawaii, and Puerto Rico). not included in your order. Fits: Jeep Wrangler. The final lift height may vary depending on the weight of your vehicle and the accessories installed. Orders are typically processed within 24 hours. Our goal is to provide top quality parts and accessories at rock bottom prices. FITS:2007-2018 JEEP WRANGLER. 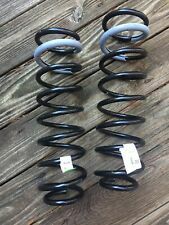 FOR SALE IS : REAR COIL SPRINGS. Part Number RK03100. 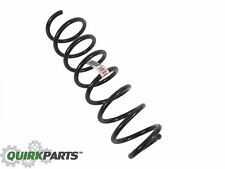 The Rock Krawler JK front coil springs combine three spring rates to maximize the amount of effective travel and ensure your spring doesn't unseat at full droop. System Includes: (2) Front coil springs.